Senate bill rewrite lets feds and local law enforcement read your e-mail without warrants: Anyone need an ACLU application form? A Senate proposal touted as protecting Americans’ e-mail privacy has been quietly rewritten, giving government agencies more surveillance power than they possess under current law, CNET has learned. ✭ Grants warrantless access to Americans’ electronic correspondence to over 22 federal agencies. Only a subpoena is required, not a search warrant signed by a judge based on probable cause. ✭ Permits state and local law enforcement to warrantlessly access Americans’ correspondence stored on systems not offered “to the public,” including university networks. ✭ Authorizes any law enforcement agency to access accounts without a warrant — or subsequent court review — if they claim “emergency” situations exist. ✭ Says providers “shall notify” law enforcement in advance of any plans to tell their customers that they’ve been the target of a warrant, order, or subpoena. ✭ Delays notification of customers whose accounts have been accessed from 3 days to “10 business days.” This notification can be postponed by up to 360 days. Christopher Calabrese, legislative counsel for the American Civil Liberties Union, said requiring warrantless access to Americans’ data “undercuts” the purpose of Leahy’s original proposal. “We believe a warrant is the appropriate standard for any contents,” he said. Marc Rotenberg, head of the Electronic Privacy Information Center, said that in light of the revelations about how former CIA director David Petraeus’ e-mail was perused by the FBI, “even the Department of Justice should concede that there’s a need for more judicial oversight,” not less. Leahy’s modified bill retains some pro-privacy components, such as requiring police to secure a warrant in many cases. But the dramatic shift, especially the regulatory agency loophole and exemption for emergency account access, likely means it will be near-impossible for tech companies to support in its new form. This is a bitter setback for Internet companies and a liberal-conservative-libertarian coalition, which had hoped to convince Congress to update the 1986 Electronic Communications Privacy Act to protect documents stored in the cloud. Leahy glued those changes onto an unrelatedprivacy-related bill supported by Netflix. Leahy, a former prosecutor, has a mixed record on privacy. He criticized the FBI’s efforts to require Internet providers to build in backdoors for law enforcement access, and introduced a billin the 1990s protecting Americans’ right to use whatever encryption products they wanted. But he also authored the 1994 Communications Assistance for Law Enforcement Act, which isnow looming over Web companies, as well as the reviled Protect IP Act. An article in The New Republic concluded Leahy’s work on the Patriot Act “appears to have made the bill less protective of civil liberties.” Leahy had introduced significant portions of the Patriot Act under the name Enhancement of Privacy and Public Safety in Cyberspace Act (PDF) a year earlier. One obvious option for the Digital Due Process coalition is the simplest: if Leahy’s committee proves to be an insurmountable roadblock in the Senate, try the courts instead. Judges already have been wrestling with how to apply the Fourth Amendment to an always-on, always-connected society. Earlier this year, the U.S. Supreme Court ruled that police needed a search warrant for GPS tracking of vehicles. Some courts have ruled that warrantless tracking of Americans’ cell phones, another coalition concern, is unconstitutional. On September 26, 2012 the United States District Court in the Northern District of Illinois awarded the National Rifle Association (NRA) $125,000 to reimburse it for attorney’s fees spent winning a lawsuit against the City of Chicago over a Chicago firearm ordinance on behalf of NRA member Shawn Gowder. In striking down the law, the Court held that the ordinance is unconstitutionally void for vagueness and also violates the plaintiff’s Second Amendment right to keep and bear arms. A copy of the court filings in this case and the $125,000 check from the City of Chicago can be viewed here. The NRA’s motion for attorney’s fees in the case of Gowder v. Chicago was granted following a successful NRA motion for summary judgment. The Gowder case challenged the constitutionality of a Chicago ordinance that banned people with certain non-violent misdemeanor convictions from possessing firearms in their homes for self-defense. Mr. Gowder had a misdemeanor conviction for “unlawful use of a weapon” (simply having a handgun on his person outside his own home). When Mr. Gowder wanted to possess a firearm in his home and sought a firearm permit (as is required by the Chicago ordinance), his application was denied. Even though his misdemeanor record did not prevent Mr. Gowder from obtaining a Firearm Owner’s Identification card, Mr. Gowder could not obtain the firearms permit necessary to possess a firearm in his own home because the law prohibited permits from being issued to anyone convicted of “an unlawful use of a weapon that is a firearm,” even if it was just a misdemeanor conviction. Although the Court was not required to consider whether the ordinance violated the Second Amendment (because it already determined that the ordinance was unconstitutionally vague), the Court nonetheless considered the U.S. Supreme Court decisions of District of Columbia v.Heller (which declared that a ban on handgun possession in the home violates the Second Amendment) and McDonald v. Chicago (which declared that the Second Amendment is fully applicable to the States), and held that the Chicago ordinance violated the Second Amendment as well. After evaluating the ordinance under a text, history, and tradition analysis, as well as a under the more conventional tests of strict scrutiny and intermediate scrutiny, the Court held that the ordinance was unconstitutional under any legal standard of review. Come On, A Faulty Tail Light Means The Police Can Assault Your Family And Ransack Your House? You really got to read this story. Is it me or does this sound like a story from The Onion? Tenth Circuit US Court of Appeals rules a police officer cannot enter a home over a minor traffic violation. A police officer has no right to pursue a minor traffic stop into a home, according to a ruling handed down Wednesday by the US Court of Appeals for the Tenth Circuit. A three-judge panel considered what happened after police in Sulphur, Oklahoma saw a suspect allegedly driving with faulty taillights on July 23, 2007. Murray County Deputy Sheriff Craig A. Billings signaled seventeen-year-old Joshua Burchett, who was driving the car, to pull over. Burchett continued on for two blocks, parked in the driveway of his parents’ three-bedroom home, ran inside and hid in the bathroom. Billings called for backup and Sulphur Police Officers Steve Watkins and Tony Simpson arrived at the scene. Billings began kicking the door, which woke the parents, Jose and Christina Mascorro. Jose Mascorro opened the door and Billings pointed a gun at his head, yelling, “On your knees [expletive]. Where is he? Where is he?” When Christina Mascorro asked whether Billings had a warrant, she was blasted in the mouth with pepper spray. Billings then sprayed the other residents, including Mascorro’s 14-year-old son. Christina Mascorro retreated to a back bedroom and called 911. Officer Watkins pulled her outside while Deputy Billings kicked in the door to the bathroom, gun drawn, to retrieve Burchett. Jose and Christina Mascorro, after being treated at the hospital, were arrested and charged with obstructing a police officer in the performance of his duty. The district court judge described the state of their home as “ransacked” after the officers left. The Mascorros sued, claiming the officers made an illegal entry, used excessive force and made a false arrest. The law enforcement officers moved to dismiss the case based on their qualified immunity from prosecution. They argued that their actions were justified because they had been in “hot pursuit” of a fleeing suspect. 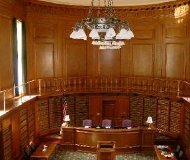 The appeals court considered US Supreme Court precedent on the question to determine whether “exigent circumstances” authorized their entry into a home without a warrant. They found only felony cases allowed such entry in extreme cases. Police officers lose their qualified immunity if their on-duty actions violated a constitutional right. The panel found these officers could be sued because they violated the Fourth Amendment protection against unreasonable searches and seizures. “No reasonable officer would have thought pursuit of a minor for a mere misdemeanor traffic offense constituted the sort of exigency permitting entry into a home without a warrant,” O’Brien concluded. Temporary, throw away phone users, beware. Your pay-as-you-go phones probably have GPS. And, according to a federal appeals court in Cincinnati, police can track the signal they emit without a warrant. The U.S. Court of Appeals for the Sixth Circuit ruled thatthe Drug Enforcement Administration committed no Fourth Amendment violation in using a drug runner’s cellphone data to track his whereabouts. The DEA obtained a court order to track Melvin Skinner’s phone, after finding his number in the course of an investigation of a large-scale drug trafficking operation. The DEA didn’t know much about Mr. Skinner or what he looked like. They knew him as Big Foot, the drug mule, and they suspected he was communicating with the leader of the trafficking operation via a secret phone that had been registered under a false name. Agents used the GPS data from his throw-away phone to track him, and he was arrested in 2006 at a rest stop near Abilene, Texas, with a motorhome filled with more than 1,100 pounds of marijuana. Mr. Skinner was convicted of drug trafficking and conspiracy to commit money laundering. On appeal, he argued that the data emitted from his cell phone couldn’t be used because the DEA failed to obtain a warrant for it, in violation of the Fourth Amendment. The question in the case was whether Mr. Skinner had a reasonable expectation of privacy in the data his phone emitted. It’s a question that several courts are wrestling with. Federal law enforcement authorities, as in this case, say that investigators don’t need search warrants to gather such information. There is no Fourth Amendment violation because Skinner did not have a reasonable expectation of privacy in the data given off by his voluntarily procured pay-as-you-go cell phone. If a tool used to transport contraband gives off a signal that can be tracked for location, certainly the police can track the signal. The law cannot be that a criminal is entitled to rely on the expected untrackability of his tools. Otherwise, dogs could not be used to track a fugitive if the fugitive did not know that the dog hounds had his scent. A getaway car could not be identified and followed based on the license plate number if the driver reasonably thought he had gotten away unseen. The recent nature of cell phone location technology does not change this. If it did, then technology would help criminals but not the police. He was joined by Judge Eric L. Clay. Judge Bernice B. Donald, who concurred but disagreed with the majority’s Fourth Amendment reasoning, said the DEA couldn’t have figured out the identity of Mr. Skinner, the make and model of his vehicle or the route he would be driving without the GPS data from his phone. Other Circuits: The Fifth Circuit has had all briefing and oral argument under submission since October 2012; The Third Circuit has previously ruled that Magistrates can require a warrant for this information and probable case. The Third Circuit case can be found here : note, 9th Circuit Judge Tashima was on the Third Circuit panel on the case.